Some days may be tougher than others, and waking up is not everyone’s professional specialty. At the moment we open our eyes, we often need that small push, whether it’s the right word or a gentle morning kiss, to get up and running. That’s why, if you’d like to improve someone’s morning mood, you might want to share one of the videos off this collection. Be it a friend or significant other, these videos are going to be the fuel to turn somebody’s daily engine on. As featured on Early Motivation | Good Morning Quotes. That’s a dynamic start for those who want to kick-start the day, a video that will inspire and motivate you. Need something really uplifting just before a productive day starts? This good morning video will certainly do for you! There’s so much beauty around us – and, when it comes to nature, flowers are the constant reminder of that quote, ready to charm and inspire us. If you agree, this video was made just for you. This 4-minute video will set the mood for a day that has just started. Ideal for someone having their morning coffee or for the early commuters. Who has said ‘no’ to a good laugh? A short video with funny good morning memes on a dance track might be the right answer to a “Now, what?” question in pre-coffee times. A video to make your day colorful, this 1-minute intervention to your early morning might turn out to be a lovely start to it. This morning, you might as well take a walk on the bright side, just to remember how you feel about life itself and focus on things that move you. That’s the second part of the video above, a lovely sequence of moving images to inspire a new start and make you start a new day on the positive side. ‘Enough with cuteness!’, said no-one ever, which is why this good morning video of cute cards with animals is a winner – note: this cat and dog friendly in equal parts! A flying friend for a flying start? Yes, why not! An entire video of great cards with butterflies to help you wish a smooth beginning for the day. If you’re fond of birds or know someone who is, share this video in the morning, and rest assured everyone will agree on its sensitivity and positivity. 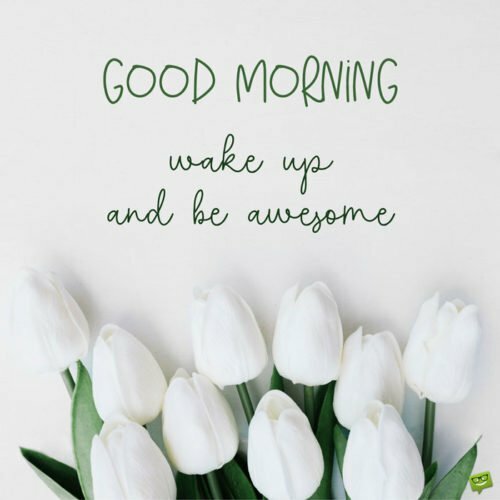 34 Good Morning Quotes to Make your Day!